- New! - Version 4.5 Now Shipping! Draftsman Cutting Shop v.4.5 - Scan it! Cut it! NEW Features in Version 4! Cutting Shop now supports optional single stroke fonts! Draftsman Cutting Shop is the premier 32 bit raster to vector conversion program for all cutting applications. The program imports color, gray and black and white images. Cutting Shop is simple to install, easy to use and extremely fast. Scans of both sketches and silhouettes are quickly converted into high quality, ready to cut, vector drawings. 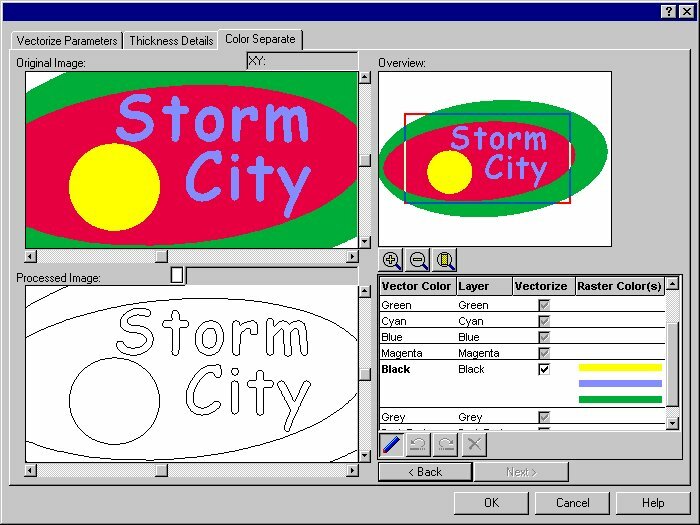 Any TrueType font is instantly outlined with long lines and arcs. Whether it is a vectorized drawing or an outlined font, complex curves are made of a series of end to end arcs and outlines are closed polygons. 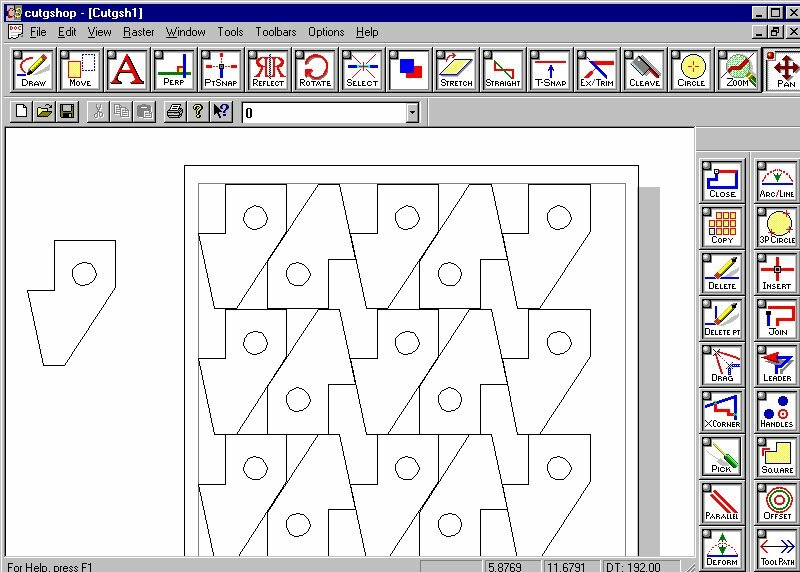 Images converted with Cutting Shop cut smooth and the cutting tool stays down until the outline is finished; optimizing your cutting operation. Cutting Shop runs under all 32 bit Windows platforms including Windows NT, 98, 2000, ME, XP, Vista and 7. Optional Stroke Fonts! Stroke fonts cut very quickly, their optimum design characteristics enable dramatically reduced cutting time, which can save you a lot of time and money. The more you inscribe the more time and money you save. If you are currently locked out of this market stroke fonts may be exactly what you need. PREPARATION - Cutting Shop has many features designed specifically for NC applications such as line offset, cuttable fills, automatic and manual tool path sorting, show direction of cut and if required, reverse it. 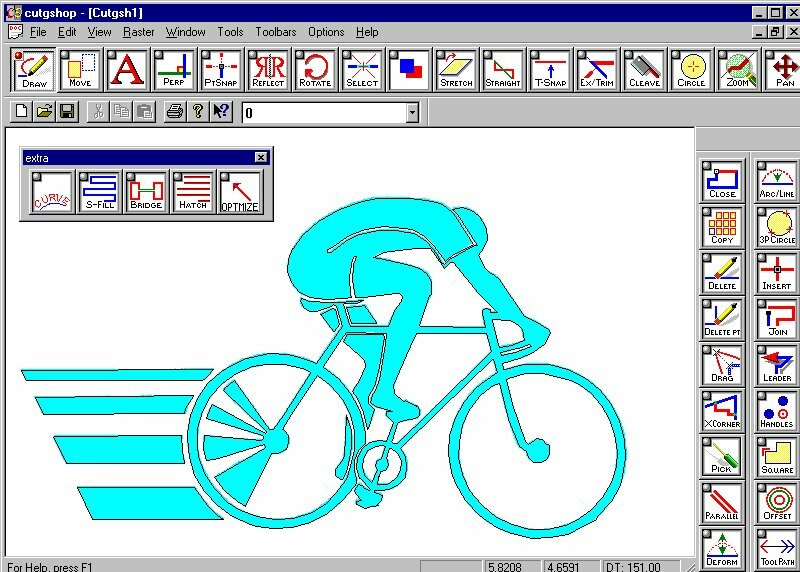 Also, Import DXF files from low end raster to vector programs and automatically create long lines and arcs from the thousands of short vectors that these programs can create. EDIT - Because Cutting Shop is a hybrid raster/vector program and because clean-up is always a concern, Cutting Shop comes with an impressive variety of vector and raster editing functions; stretch, scale, move, copy, delete, insert and join - about 40 of these tools are available. EXPORT - Vectors are exported to DXF, PLT, IGES and other CAD and CAM specific formats. Vectors, raster, or the combined raster and vector hybrid image can be saved or printed. Vectors can be drawn on the raster image and the combined raster/vector drawing can be saved back as a raster drawing. • Trace with Lines, Circles, Arcs, Text and polygons. Draftsman first came to market in 1990, running stand alone under DOS. Numerous upgrades and operating system modifications have helped Arbor Image to sell thousands of copies and to become well known in the CAD industry for high quality raster to vector conversion. A Free Working Demo of Cutting Shop is Now Available! Windows, Windows 98, Windows 2000 Windows ME, Windows XP, Windows Vista and Windows 7 are trademarks or registered trademarks of Microsoft.